Maxine Waters was downright giddy as she held her first conference as the new chairwoman of the powerful House Financial Services Committee. The 80-year-old Democrat wasted no time threatening President Donald Trump. She arrogantly said, “I have the gavel,” and then started laughing, claiming the president won’t be in office to veto her proposed legislation. But, that’s not all. Maxine got the wrong information, and she got destroyed. Don’t miss this. Maxine Waters thinks she is the new queen bee on Capitol Hill now that she has ascended to become the new chairwoman of the powerful House Financial Services Committee (HFSC). The bumbling Democratic lawmaker was the featured speaker at the left-leaning Center for American Progress on Wednesday. She thought she was high and mighty, but it was a real disaster. 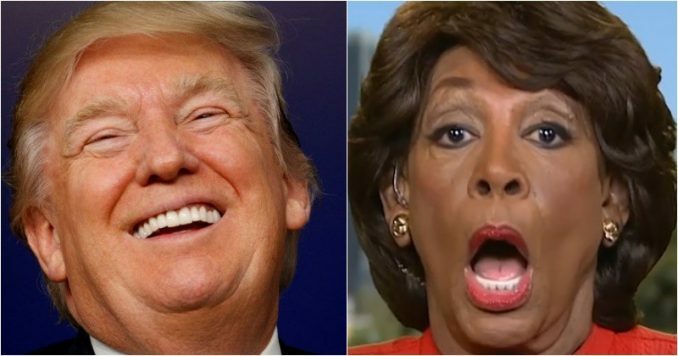 “House Financial Services Committee Chair Rep. Maxine Waters (D-CA) doesn’t seem to think that President Trump will be president for much longer, telling Neera Tanden that the House will pass and send consumer protection legislation to ‘whoever is president at the time,'” reported NTK. Wacky Waters told the crowd of about 50 that the Trump administration doesn’t care about the finances of American families in need, so she is going to be their savior. Maxine fails to realize it will go nowhere since the Republican-held Senate won’t pass a dang thing Auntie Maxine proposes. But, I digress. “We’re not relying on this administration for much of anything,” Maxine added before saying she believes a few Republicans will work with her. Then, the power-hungry Waters threatened them with her gavel, which is no threat at all. “But, of course, if they don’t, I have the gavel. So, we’re going to introduce our legislation, we’re going to take it to the floor, and we’re going to get it passed. We’re going to do everything that we can to work very closely with the Senate,” Waters said. Waters then told Tanden that she believes some Senate Republicans will support these bills and help get them passed. “And, then, we’re going to send it to whoever is president at the time,” Waters said, laughing like a hyena. Let’s be clear: Maxine Waters is a lame duck chairwoman. Yes, she has a gavel, but it wields no power at all. And, that makes her arrogance even more idiotic. But, she wasn’t done. Mad Maxine went on about this Russian oligarch named Oleg Deripaska. You see, in her deluded world, anyone with a Russian name must be colluding with Trump. Boy, she was wrong. “I am very concerned about the Treasury Department’s actions to lift sanctions on businesses connected to Oleg Deripaska. Deripaska is a Russian oligarch with close ties to Vladimir Putin, who also has a history with Paul Manafort, the former Trump campaign chairman who has been convicted of serious financial crimes uncovered as a result of Special Counsel Mueller’s investigation into Russian interference in the last presidential election,” alledged Waters. She went on to allege that this Russian oligarch was somehow involved with Trump in swaying the 2016 election. Well, Waters is so inept in her obsession to prove the president colluded with Russians, she got her facts all wrong. Deripaska was approached by that convicted liar, former Deputy FBI Director Andrew McCabe, and his sidekick FBI Agent Peter Strzok to set up Trump in 2016, The Hill reported. The Russian oligarch was also working with Robert Mueller back in 2009. Yes, that’s right. “In 2009, when Mueller ran the FBI, the bureau asked Russian oligarch Oleg Deripaska to spend millions of his own dollars funding an FBI-supervised operation to rescue a retired FBI agent, Robert Levinson, captured in Iran while working for the CIA in 2007,” The Hill reported. Maxine Waters must be getting her orders from the scared deep state rats who see Deripaska as a real risk. “Because of the associations with the scheme and coup-plotters, Oleg has buckets of dirt on corrupt U.S. officials who were trying to target Donald Trump. In the wake of a soft-coup failure, Oleg then became a risk. So, it comes as no surprise to see today the U.S. DOJ and Treasury turn on him,” explained CTH. Maxine Waters is a blowhard who has no idea what she is talking about. She is a useful idiot for the deep state rats. She sounds crazy when she starts spewing this nonsense about President Trump and this Russian oligarch, who everyone inside the Beltway knows was working for Mueller and the FBI. Thank God, the Republicans hold the majority in the Senate. Mad Maxine is a lame duck chairwoman, who will pass zero legislation. The blundering Democrat is just a sad punchline, and she doesn’t even know it.